The United Nations Office on Drugs and Crime (UNODC) (in French Office des Nations unies contre la drogue et le crime) is a United Nations office that was established in 1997 as the Office for Drug Control and Crime Prevention by combining the United Nations International Drug Control Program (UNDCP) and the Crime Prevention and Criminal Justice Division in the United Nations Office at Vienna. 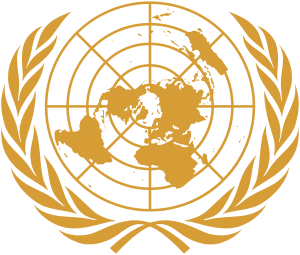 It is a member of the United Nations Development Group and was renamed the United Nations Office on Drugs and Crime in 2002. In 2016 - 2017 it has an estimated biannual budget of US$700 million. These are the main themes that UNODC deals with: Alternative Development, Corruption, Criminal Justice, Prison Reform and Crime Prevention, Drug Prevention, -Treatment and Care, HIV and AIDS, Human Trafficking and Migrant Smuggling, Money Laundering, Organized Crime, Piracy, Terrorism Prevention. UNODC, as the custodian of UNCAC, is also one of the main initiators of the establishment of the International Anti-Corruption Academy (IACA), whose main function is to, inter alia, facilitate more effective implementation of the UNCAC. ↑ United Nations General Assembly Session 51 Document 950. Renewing the United Nations: A Program for Reform A/51/950 page 49. 14 July 1997. Retrieved 2007-11-16. ↑ "UNDG Members". UNDG. Archived from the original on May 11, 2011. ↑ United Nations Secretariat Secretary-General's Bulletin Organization of the United Nations Office on Drugs and Crime ST/SGB/2004/6 page 1. 15 March 2004. Retrieved 2007-11-16. ↑ United Nations Secretariat General Assembly document Organization of the United Nations Office on Drugs and Crime A/70/6 9 April 2015. Retrieved 2016-07-20. ↑ "About Us". United Nations Office on Drugs and Crime. UNODC. 2014. Retrieved 2014-10-28. 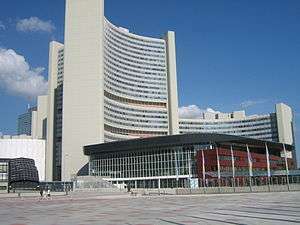 The Terrorism Prevention Branch (TPB) of the United Nations Office on Drugs and Crime (UNODC) is the key United Nations entity with the mandate and expertise to deliver counter-terrorism legal technical assistance to Member States for the ratification, legislative incorporation and implementation of the international legal instruments against terrorism. [...] Since 2003, the Branch administers the Global Project on Strengthening the Legal Regime against Terrorism which provides the operational framework for UNODC's specialized legal and capacity building assistance related to terrorism. ↑ "World Drug Report - Global Illicit Drug Trends". UNODC. 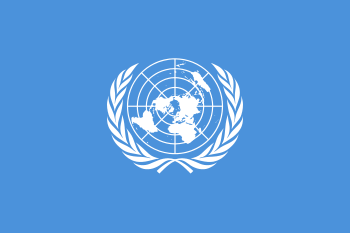 ↑ "United Nations Convention against Transnational Organized Crime and the Protocols Thereto,2000". UNODC. ↑ "Single Convention on Narcotic Drugs, 1961" (PDF). INCB. ↑ "Convention on Psychotropic Substances, 1971" (PDF). INCB. ↑ "United Nations Convention Against Illicit Traffic in Narcotic Drugs and Psychotropic Substances, 1988" (PDF). UNODC. ↑ "About the World Drug Campaign". UNODC. ↑ "ACT Against Corruption: About the Campaign". UNODC. ↑ "What is Think AIDS?". UNODC. ↑ "What is the Blue Heart Campaign?". UNODC. ↑ "Svensk bedömning av multilaterala organisationer - FN:s organ mot brott och narkotika, UNODC" [Swedish assessment of multilateral organizations - United Nations Office on Drugs and Crime, UNODC] (PDF) (in Swedish). Ministry of Foreign Affairs Sweden. 2008. p. 2. 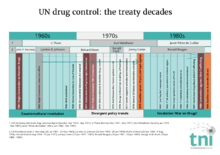 ↑ "The United Nations and Harm Reduction Overview and Links". TNI. ↑ "Drug use prevention, treatment and care". UNODC. ↑ "Addicted to death: Executions for drug offenses in Iran" (PDF). Amnesty International. 2011.